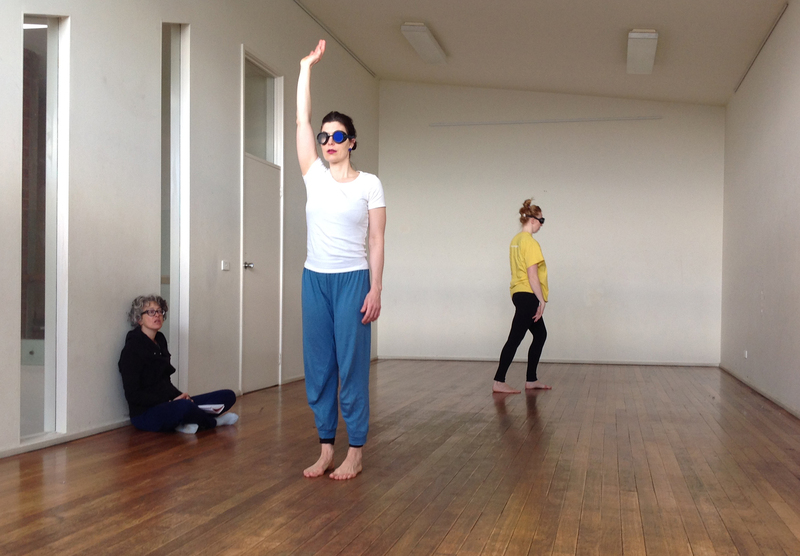 This series of sessions explored the impact of having both vision and hearing occluded during dance movement. Both eyes were covered with dark patches and the ears with sound cancelling earphones. The dancers expressed an initial discomfort as they adapted to the conditions. They reported feeling that their movements were more confined and restricted and expressed a sense of being “locked in”. Of particular interest was the observation that their movement was continuous with no pauses, suggesting the main focus was using movement to explore the space physically. This was supported by comments such as “I need to put myself everywhere to explore all facets of the space”. Tactile discrimination became the most dominant sense. Both dancers reported that their sense of balance was not affected and that one’s body against the ground was the key reference point. Movement was described as being “dense and continuous”. These three words cover the most immense amount of information to do with what is already known in the body and how it might proceed through various tasks. 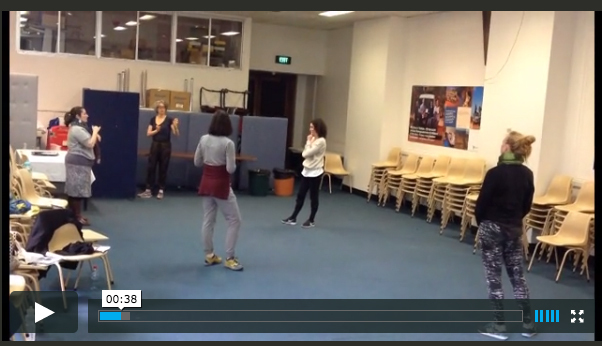 In this footage we were building on a series of situations where I had been using a variety of modes to communicate choreography. 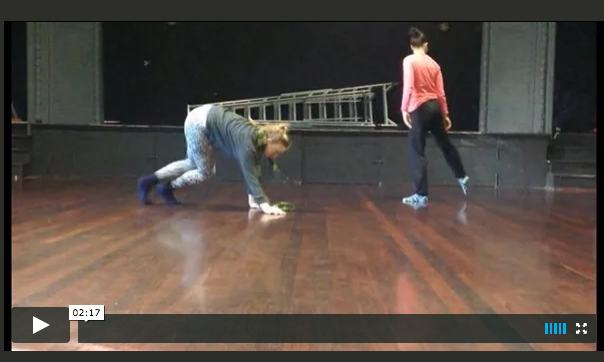 In this footage, choreography means asking the dancers to do a phrase of dance material that I had made without thinking about passing it on to another person, that was made using a physical rather than logocentric logic ( no pun intended). I communicated it to them only verbally, not demonstrating physically, therefore I had to translate it from a physical dimension into words, which required me to actually do it, therefore I went behind the screen. 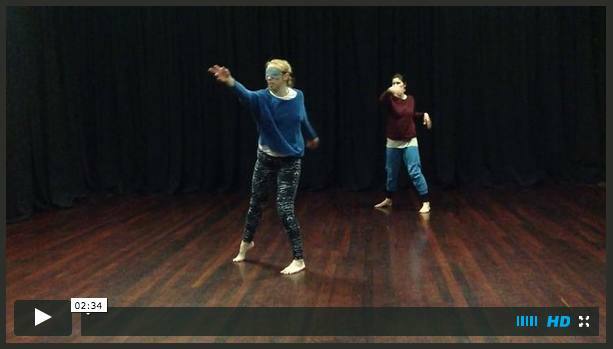 One of the dancers had a further filter, as she was receiving the information through the filter of an Auslan interpreter. I wasn’t interested in a particular outcome, just how physical, spatial, rhythmic understanding is built. I have been thinking a lot about translation. This is somehow odd for me as translation from one medium to another is not something I am interested in as a choreographic tool. But in the research I am undertaking at the moment. Perhaps translation is just not quite the right word. Recently I interviewed English dancer Mickel Smithens about his experience in working as a dancer in a variety of modes and situations, as teacher and as performer. How he builds information through a variety and combination of sensory receptors: using touch, pacing,rhythm and memory creating a spatial filed that he can move in and with others with limited sight. Intrinsic to this is the parallel physical feedback that he uses developed through long experience in Contact Improvisation and Skinner Releasing, both disciplines that train a deep internal awareness. I presented with Fleur O’Hare to the Research Unit in Public Cultures at the University of Melbourne, a summary of what we have been working on so far in this project, and it struck me in the discussions following that the language I use to endeavour to communicate what I think I understand as an artist, and how it may be construed through the lens of another discipline may be variant. This is particularly pertinent to my interests at the moment in the modes of communication between the myself and the dancers with whom i work and the myriad of possibilities both verbal and physical. Working with the relationships of head and eyes, hand and eyes, and reach – gaze to the extent of reach and beyond. In looking at the relationship between these things it is as much about knowing what they are – understanding similarities and differences – as not knowing. Most importantly, it is about observing. Within studio research, the available sensorial feedback is altered with the use of goggles that simulate various limits in visual information. The dancers work with different types and degrees of occlusion, improvising and repeating known and learnt dance material. Alterations in effort within these variations are observed, as well as the perception of relative space in relationship to memory. 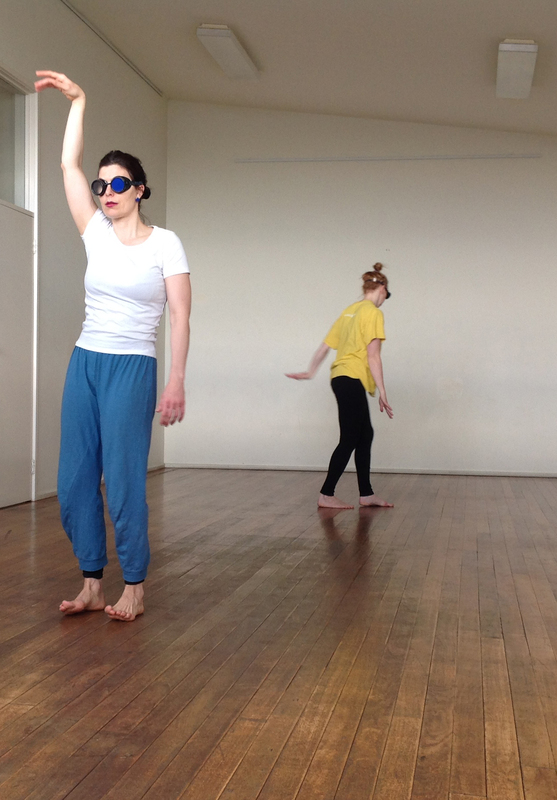 THIS RESIDENCY PROJECT IS A RESEARCH OF THE RELATIONSHIP BETWEEN SIGHT AND OTHER SENSES IN THE SCOPE OF PROPRIOCEPTIVE AND SPATIAL AWARENESS FOR DANCERS AND FOR PROCESSES OF MAKING CHOREOGRAPHY. WITH FLEUR O’HARE FROM THE CENTRE FOR EYE RESEARCH AUSTRALIA, UNIVERSITY OF MELBOURNE, THIS RESEARCH FOCUS WILL BE EXPLORED IN A RANGE OF CONTEXTS. 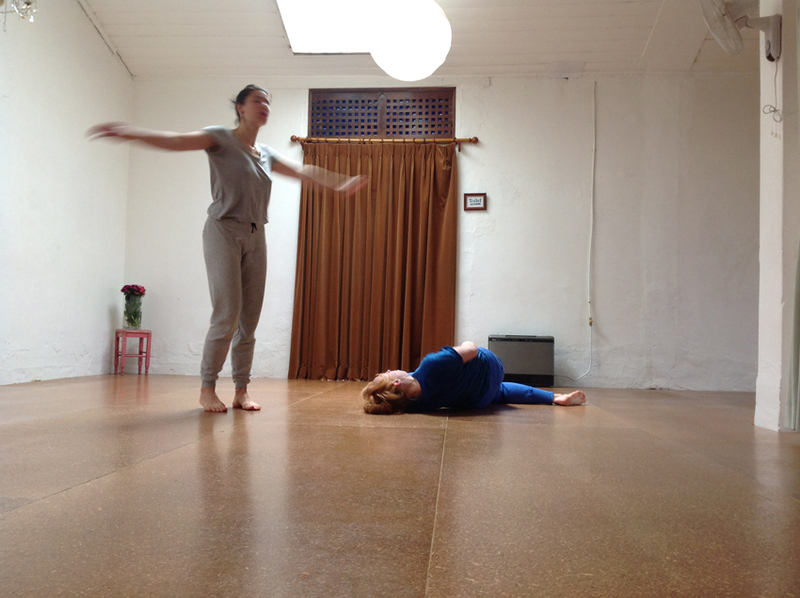 ‘PEOPLE’S ORIENTATION IN THE WORLD’ IS A CENTRAL INTEREST WITHIN SHELLEY LASICA’S CHOREOGRAPHIC PRACTICE. Welcome to my ANAT blog. I will be posting as I undertake my Synapse residency over the next months.